Even though Albemarle (NYSE:ALB) and Lithium Americas (NYSE:LAC) are in the same business of trying to supply the world with increasingly critical metal lithium, they couldn't be further apart. Albemarle is the world's largest producer, whereas Lithium Americas has yet to sell a single ton of the stuff. Anything with the word "lithium" in it is likely to attract investors these days, especially with lithium-ion batteries taking center stage as the premier solution to electrify transportation and make wind and solar power more viable. Some investors may be considering whether to consider a start-up with immense growth potential or an established leader. So let's look at the case for the two companies and determine which one is the better buy today. To invest in a start-up mining company like Lithium Americas is to be incredibly bullish on the prospects of lithium over the next several years. For now, the company is only a business plan. It recently started construction at its first lithium extraction facility in Argentina, which will produce about 25,000 tons per year of battery-grade lithium from lithium carbonate and have a 40-year shelf life. The facility should be up and running next year. On top of its project in Argentina, it is also in the design phase for a lithium mine in Nevada that it intends to start producing at in 2022. This facility is designed to produce 60,000 tons of lithium carbonate and would have relatively similar operating costs. Using the same price assumptions, management things this facility will generate $520 million in annual EBITDA. Adding it all up, Lithium Americas expects to be able to generate around $675 million in EBITDA annually once all of these facilities run at full capacity. For a stock with a market cap of only $300 million, this sounds as if it could be a monumental opportunity. With all that upside, though, there is some significant operational risk. For this business to generate that kind of profit, it needs lithium prices to stay as high as management projects, and it needs to deliver facilities with that low of a cost structure. It's very early in the process to know for certain that these facilities can produce at such a low cost. Another thing to consider is Lithium Americas' partner in the project, Chinese company Ganfeng Lithium. Having a partner is one thing, but Ganfeng is a 37% owner of the Argentina facility, owns 17% of Lithium Americas' stock, and is providing all of Lithium Americas' financing with some rather lucrative terms related to production and off-take prices. That means Ganfeng has a lot of control over Lithium Americas, and its interests may not necessarily line up with shareholders' at all times. Albemarle is also looking to grow its business over the next several years with some considerable investments in new lithium capacity. At the end of 2017, the company had 65,000 tons of nameplate capacity. By 2021, it anticipates that its production will jump to 165,000 million tons of lithium -- from both lithium carbonate and lithium hydroxide. It also has other projects in the hopper that could boost production of 225,000 million tons per year, most of which have long-term sales contracts already in place. That's even after putting a significant project on hold for the time being. That's a lot of lithium growth over the next decade, but the ups and downs of the commodity cycle can make investing in even the most promising metals and minerals fraught with risk. Albemarle sets itself apart in this business because it isn't a pure-play lithium producer. It's also one of the world's largest suppliers of bromides and specialty catalyst materials. These two business segments were responsible for 26% and 27% Albemarle's trailing-12-month EBITDA. While management admits that the growth opportunities for these two businesses are considerably smaller than lithium, they are high-margin businesses that generate lots of cash to help fuel its future capital spending plans. With cash coming in the door to pay for its expansion plans and an attractive balance sheet -- debt to EBITDA stands at a comfortable 1.6 -- the company looks as if it can tackle the spending needed for these expansion plans. If there was one thing to critique management for, it's the decision to do an accelerated share-repurchase program right now. While repurchase programs are fine if they reduce share count over the long haul, they're best used by mature companies with limited growth prospects. Albemarle isn't hurting for growth and would probably be better off plowing that cash into its development projects rather than buying back stock if it means taking on debt to build its new facilities. Lithium Americas has the potential to be an incredible growth stock over the next few years. Investors have to realize, though, that there is a lot of execution risk involved here and that the relationship with Ganfeng Lithium may be a little too close for comfort. It may be worth taking a small flyer on this stock, but go in knowing it could blow up in your face. Stacking these two up against each other, Albemarle looks like the better buy. After its stock has dropped 43% over the past year, it trades at an enterprise value-to-EBITDA ratio of 8.8. That's a reasonable price to pay for a company with a solid foundation of earnings in diverse end markets and a large growth plan over the next decade. If investors want to put a lithium stock on their radar, Albemarle should be high on the list. 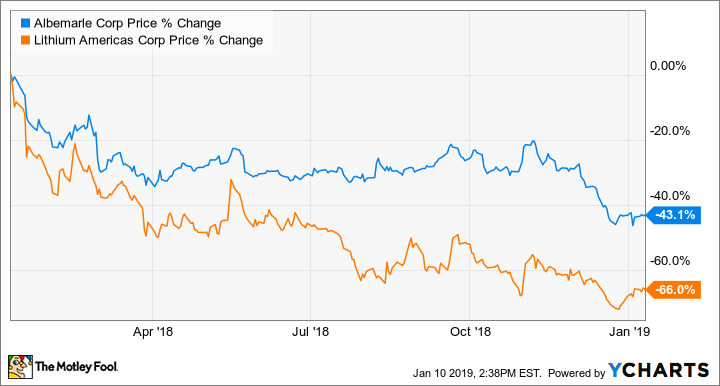 Is Lithium Stock Lithium Americas Corp. a Buy?